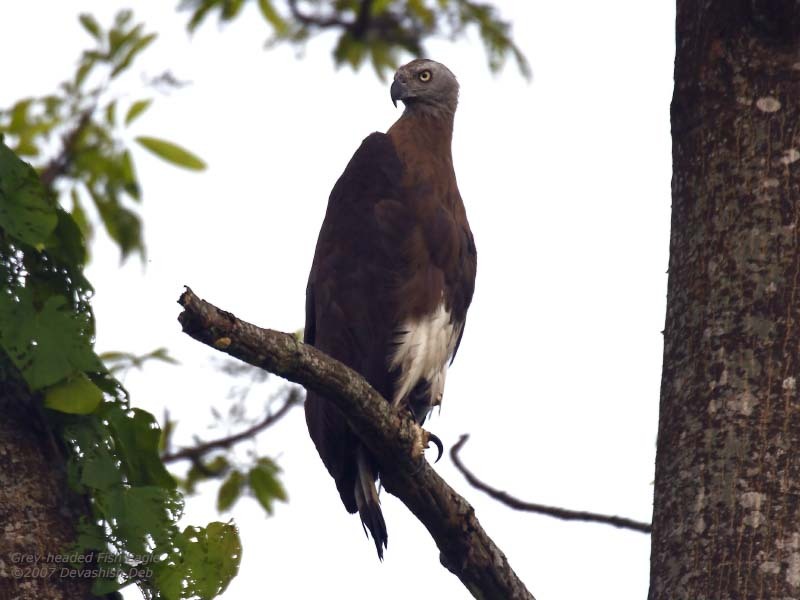 We recorded two Grey-headed Fish Eagles just 100 meters apart within the sanctuary, described by the guards as capable of capturing and devouring large, 3-4 Kg fish. A currentless woodland rivulet almost 20 mtr wide borders one side of the Pobitora sanctuary. I could see a Fish Eagle perched in the foliage keenly watching a mahout scrubbing an elephant on the other side. The forest guards use a few tame elephants for patrolling the sanctuary. A little later the eagle flew, in a kind of majestic rush, to another tree very near the elephant. Soon the guards took the elephant away and now the eagle started watching the clear water intently and was very still. To get a better image I decided to get near the bird. On my side there were a few weathered and vacant boats, and somehow I could convince a boatman about to cross the rivulet to row near the eagle. His boat was freshly painted with oily charcoal and wasn't fully dry yet, undeterred I put a few sheets of newspaper on the wooden crosspieces and somehow stabilized myself on the long and thin boat. We sailed near the bird, the Fish Eagle in the meanwhile was trying to balance itself on the weak upper twigs with its arms swooped down and I was not getting a clear shot. The boatman suggested photographing another eagle that he knew of 100 mtr ahead. I could see the silhouette of the other Fish-eagle on an overhung branch. The boat cut its way gently through the still forest water towards this second eagle. Slowly we drew near, and the eagle was rather disinterested even on our approach of about 5 mtr, I had to eventually zoom out my camera lens to get the full bird. We remained motionless, merged in the ancient forest, near the eagle for a few minutes admiring its grandeur and then slowly backed off. Copyright © 2006-2013 birdpoints. All rights reserved.